Yesterday afternoon, a huge box appeared at our front door, delivered by an employee of Monarch Basics. For the third year running, Monarch has answered our call for help at the start of a theatre season. With nearly fifty kids enrolled in a year-long theatrical and education programme that we offer at virtually no cost to the families, with a staff and crew that are entirely and completely volunteering their services throughout the year, Riverfront operates on a shoestring budget, and we rely on the help of fundraising and community sponsors – as well, of course, as our ticket sales! Monarch Basics has, once again, answered our need for our regular operational supplies! We have scripts for three plays to stuff into those duotangs. The file folders are going to be used for this year’s lapbooks on Pride and Prejudice, Aladdin, and of course, A Salute to Peanuts! We have CDs of music to burn and hand out to the kids for them to practise with at home. Scripts have to be highlighted, notes taken! There is so much going on in a rehearsal day at Riverfront. It’s non-stop activity, and we’ve really developed an entire curriculum around the plays we’re working on. By supplying us with highlighters, pens, pencils, pencil sharpeners, markers, coloured pencils, tape, glue sticks, CDs and CD sleeves, file folders, and duotangs, Monarch Basics has just given us another year with an easy start. 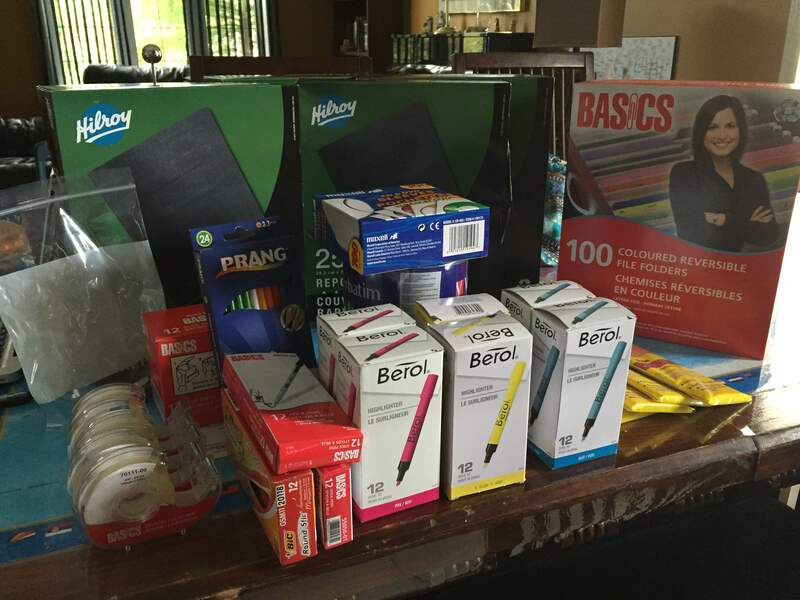 Their community-mindedness has earned them our customer loyalty – I haven’t shopped for stationery supplies, office supplies, etc., anywhere else for the past three years, and I encourage all our friends and families to do the same. Now, about those scripts – that’s a lot of scripts! All our plays this year are new adaptations, custom-created for Riverfront by Kristina and Caroline Garswood. We have thirty Seniors, eighteen Juniors, and three plays. We also need copies for our directors and production crew. That’s a LOT of printing. The scripts, the Student Booklets that we’ll be handing out on Saturday, the posters and flyers that we print throughout the year – all of this printing is donated by the wonderful people at Southland Insurance. They’ve been sponsoring Riverfront since May of 2011. We’re also more than grateful for the rehearsal space that we have been provided with, the rooms we call home at Riverfront each Saturday. As a branch of HOPE4Y (House of Play and Education for Youth) and YCAInc (Youth Connection Association), we have been given the free use of two rooms at the Herb Gray Centre on Ouellette Avenue, and that has been a real blessing. Do we need actual money for our operational costs? Absolutely, we do. We have to pay rental costs for our performance space at The Olde Walkerville Theatre, we have to rent technical equipment, we have other supplies that we have to buy on a regular basis, and material and supplies for costumes and sets. Last year, we were able to purchase some musical equipment to help with our regular rehearsals and performances. We have ongoing storage costs of $200/month (anyone have any storage they can offer?). We have a budget that we have to manage very carefully, and we do request actual financial support. I sent out a whole bunch of requests to different businesses for sponsorship in the past few weeks, and I’ll be sending more out as the year progresses. Our SPONSORSHIP FORM can be found here as well, and we’d be delighted to invite more sponsors aboard. But sponsorship “in kind,” meeting some of our specific needs rather than providing money to pay for them – that helps us enormously, too. One of our other big needs is for promotion and advertising. Everything we do is designed to support the students in their productions – and it all falls down if we can’t pull in the audiences they deserve to see their hard work. So right now, we’re reaching out to advertising and promotional agencies, hoping that they’ll join us in getting the word out about Riverfront and our shows. If, in reading this, it occurs to you that you have the means to help us in any way – that you can and want to contribute to our season – we would love to talk with you. We have a passion for this theatre group, and are so grateful that there are community members like Southland and Monarch Basics who are willing to partner with us in making everything we do a reality for these kids! If you’re interested in being one of those partners, email us today at RiverfrontTheatreCompany@gmail.com! Previous: Previous post: The 2nd Annual Riverfront Theatre Company Car Wash! Next: Next post: Our 12th Season Has Kicked Off!